It's becoming harder and harder for me to look at perfume guides and evaluate them from a distance. Obviously, I'm not the target reader of the majority of these books, so reviewing them becomes a process in which I'm having imaginary conversations with the authors, which is not always what a potential reader needs. Enter the Husband, who represents a typical reader of this blog: a well-informed, well-sniffed, curious, and interested individual, but his life does not revolve around reading, writing, and talking about perfume (at least if he can help it). The review below is his. Any book that has the presumption to call itself a Bible immediately sets the bar too high. And while this lovely book can be called many things, a bible is definitely not one of them. Maybe a more fitting title would have been “My First Perfume Book”. The Perfume Bible is a very girly, beautifully done introductory book to many aspects of the perfume world with several unexpected extra topics that broaden the discussion. But it’s still not a bible. It is an admirable task to try and write a book that would take a perfume novice and introduce her to the wonderful world of scent beyond the basic Sephora, mass market, celebrity and department store spray-ladies. The book tries to cover a lot of ground in less than 200 pages, jumping through a wide range of topics that include some basic information about perfume families, ingredients, how perfume is made, perfumers (noses), the history of perfume in 6 pages, perfume concentrations, perfume terminology, and a list of 100 perfumes to try before you die. It also includes a few more advanced topics such as naturals and synthetics, niche brands, niche perfume stores and a useful Q&A. There’s also a list of sources such as blogs and books (including a mention of The Non-Blonde. Gaia and I were tickled pink. No pun intended). The Perfume Bible also adds a few extra topics to the mix, like growing perfume plants, collecting perfume advertising, and collecting perfume bottles. All this breadth comes at the expense of depth in almost all subjects, which is perfectly fine for an introductory book trying to open a door to a new world for the reader. But not feeling certain what will resonate with their reader, the authors tried everything they can think of. I was reminded of these colorful but thin travel books that aim to please absolutely all travelers by mixing the tried and true with the anecdotal. I admit to owning a few of those. As stated, this is a very girly book. From the pink cover and beautiful Rene Gruau-inspired watercolor illustrations, to the fact that the section dedicated to “Men’s Perfume” includes only 10 of them (!). Why is there an inherent assumption that men will not be interested? If you focus on the female audience, why include a masculine section at all? Maybe it’s a gift guide, but even as such it is seriously lacking. (Editor's notes: No Egoiste, no Terre d'Hermes, Sartorial, Nicolai's New York, Knize Ten, Tom of Finland, A*Men, or anything from MPG? I could go on and on and on). There is a section dedicated to bespoke perfume which brings again to mind the question of who the authors were targeting. Bespoke perfumes usually cost thousands of dollars and are a true luxury. But it’s not a necessary topic for an introductory book that explains the difference between an eau de cologne and a pure parfum. I liked the bias towards niche brands and the emphasis on the credited perfumer as an important aspect of the modern perfume world. Any Top 100 list is very personal and the choices tell a lot about the personal preferences of the authors. This particular list is decidedly on the feminine and lighter side of the spectrum. Fairley and McKay chose Fracas over Bandit, Feminite Du Bois over MKK, and Alien over Angel. There’s not a leather to be found and only one oud. While there is a good answer in the very solid Q&A section to the question “Why doesn't my favourite perfume smells like it used to?” that discusses reformulations in a very frank way, it does not really talk about vintage perfumes other than to quote Roja Dove who says that in collecting bottles the juice is irrelevant and mention that perfume older than 2 years may not be good anymore. I'd give money to see Roja's personal collection of vintage perfumes, and would bet money they're far far older. I find the idea of a “Signature Scent” very outdated. The authors make a big deal of finding a scent your children will always associate with you. My mother is indeed loyal to a fault to her Nina Ricci L’Air du Temps, but in a book that is all about exploring the vast and diverse universe of scent this is a throwback to different times. This suggestion does not connect to the overall theme. How about having a perfume wardrobe? We now go back to the question of who is this book for. It is definitely not for a fragonerd who already knows much more than this book offers. Still, the next time a niece or a young friend shows interest in your perfume passion, this book may be just the nudge down the slippery slope. Next thing you know, they’ll come back to you asking for some samples, and that's a very good thing. 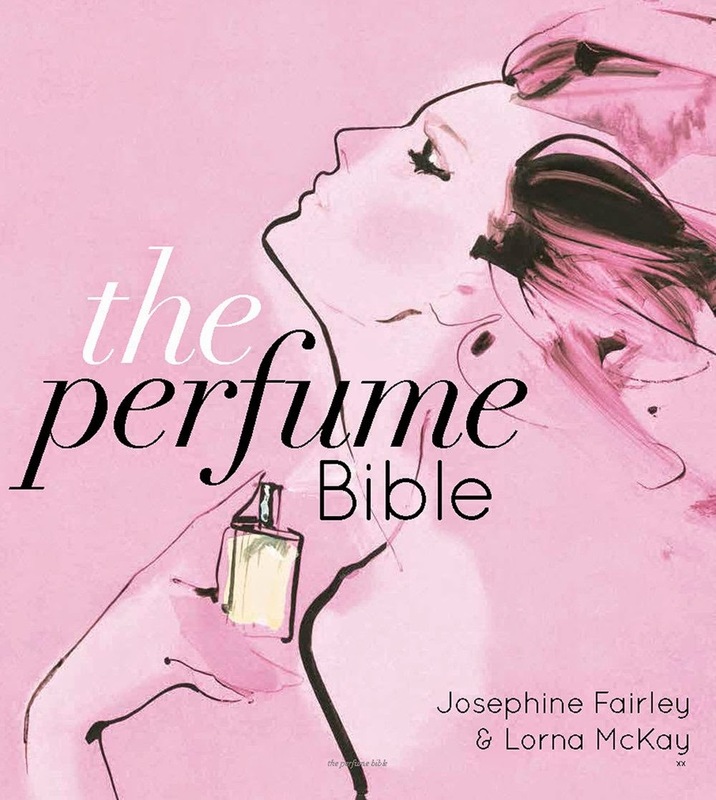 The Perfume Bible By Josephine Fairley & Lorna McKay (hardcover, $22.44) is available on Amazon through third party sellers. To the Husband: I'm always tickled pink (no pun intended either) to see that your input will be what we read for today. Your insight is always right on the money and I believe we got that in your review of this book. The authors were operating on a very basic level when they did not take a step over to recommending the masculine side (my favorite by the way). I can also add Caron Un Pour Homme (thanks to Bois de Jasmin) and just plain Old Spice to that list. When I wear Old Spice (the original version) I get so many compliments! I'm going to change subjects here. Probably a couple of years ago, when Gaia was summarizing a trip the two of you took to Paris, she quoted you as asking a Parisian saleslady in one of the shops for *something with more character. * That comment amused me immensely and I've obviously never forgotten it. Now I'm just wondering - just what denotes "character" in a perfume to you? Might this book also be good for one's own husband or best friend who simply don't understand one's own "habit" as it were? Maybe fascination is a better word. I can really appreciate how hard it must be to try to write any sort of comprehensive book about perfume. But...*no* leather in their top 100?? Reeling a bit from shock. Not even a very soft, floral, sueded leather? Simply out of respect for how important leather notes have been in the history of perfumery I'd think they could have included at least one that deserves consideration and/or objective admiration as a classic. And then there is the part about only ten fragrances for men. Astonishing for a multitude of reasons. What decade are they in? Oh, yes, they appear to be in the era of signature scents. A time travel book with a Renee Gruau style cover, but no vintage section. Fascinating. OK, I know I'm being harsh and, again, I know how hard it must be to cover such a huge topic and I see there were some positive points (mentioning this blog - excellent decision on their part), but I have to admit I'm so I'm so very, very out of sync with some of the other (to me) glaring omissions that I just don't think I'd personally choose to give this to a newbie - would rather give them a huge bag of samples, take time chatting with them about them and give one of the other wonderful books out there, even if some of them have more specific focuses. Anyway, I enjoyed reading this and I'm glad you reviewed it - saves me time looking into it on Amazon. Thank you for the very helpful review. I was never the intended audience for this book, but I might recommend it to friends who are looking to expand their horizons. On a side note, I agree wholeheartedly with your opinion that the endorsement of a scent signature as some kind of personal goal is fairly outdated. And from the way the book frames it, it sounds more specifically, a bit too much like hetero-normative, bourgeois prescriptivism to be entirely useful. I require a signature scent for my children to remember me by? I am side-eyeing that one pretty hard.